It’s snowing, again. When it snows I have my own personal bake-off. Today I thought scones for breakfast would please the fam damily. This recipe is one I’ve been using for years. I like to add dried fruit to my scones. You can dice up apricots, or dried cranberries or dried blueberries. Trader Joe’s has freeze dried fruits. I love using them in scones. I also love chocolate chips in scones. I like to use the mini chocolate chips, but any kind of chocolate will do. Okay, I love scones. 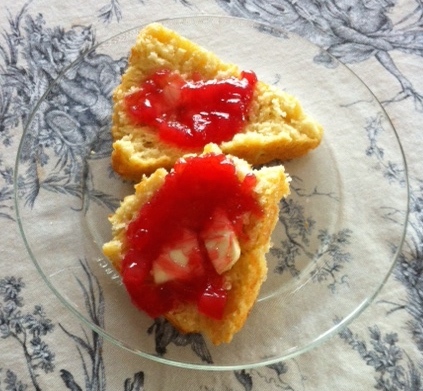 Today I made plain scones because I made some strawberry rhubarb jelly last week. A little butter on a warm scone, topped with jam or jelly is heavenly. Preheat your oven to 375 degrees. If you using an 8-wedge scone pan, lightly grease the wells. Or line a cookie sheet with parchment paper. I have recently decided I like using the cookie sheet method better. Scone pans are difficult to clean. Round scones bake more evenly. My new revelation. Ta.Da. In a large mixing bowl, whisk together all the dry ingredients. Cut in the cold butter just until the mixture is unevenly crumbly. It’s okay for some larger chunks of butter to remain. I used to use my hands to do this. They have been achy this winter, so I bought a pastry blender. What a difference this makes. It does a great job, does it quickly and my hands don’t hurt afterwards. Yay me. CHANGE: I have found, accidentally, that you should put the cold, cubed butter, in the bowl and then pour the sugar over the butter. Coat the butter in sugar. Give it a quick stir. This helps separate the butter cubes, and mix with the rest of the ingredients easier. So, butter, then sugar, and then add the flour, baking powder, and salt. It’s much easier to mix all the dry ingredients this way, rather than dumping them all in at once. I promise. Measure milk in measuring cup and add the eggs and vanilla extract. At the risk of sounding too Martha-Stewarty or Ina-like, use a good vanilla. I like to use vanilla extract that has some flecks of vanilla bean in it. It enhances all your baked goodies. Beat together to break up the eggs. Add the liquid ingredients to the dry ingredients and stir until all is moistened and holds together. If you want raspberry scones, I strongly suggest using freeze dried raspberries. I use 1/2 a package of the Trader Joe’s freeze dried raspberries. Gently stir them in at the end. Trying not to break them up. Using freeze dried fruits adds the fruit flavor, without extra liquid. I use a scone pan, but you can you a muffin tin, or parchment paper. See the original recipe for those cooking directions. 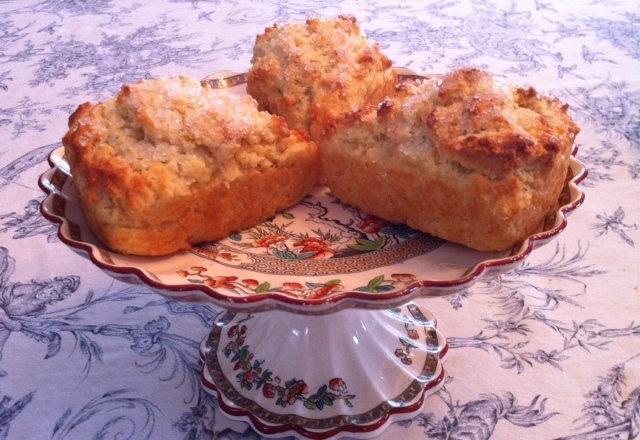 I like to sprinkle my scones with sparkling white sugar for a great crunch. You can use granulated sugar or cinnamon sugar, or just leave them plain. Bake scones in pan for 25 minutes or until lightly browned. On a cookie sheet, they take anywhere from 15-20 minutes depending if you make 6 or 8. Check the bottom of the scones for browning. Remove from oven and let them sit for 5 minutes before removing them from the pan. Serve warm with butter and jam. These freeze well too. Don’t shy away from trying this non-recipe. The Chipotle part is totally optional. In case you’ve been living in an igloo, lately we’ve had extreme winter weather here in New England. All the cold and snow draws me to the warmth and comfort of soups. I’ve been making a lot of the oldies but goldies. I stumbled upon a recipe for a white bean soup that knocked my Boston Red Sox off! It’s very simple but flavorful. You could make this with items in your pantry. Okay. I’ve stopped laughing. Who has a “pantry”? I store my canned goods in a cabinet or a hall closet. We pretend it’s a “pantry”. Tom Brady and me, that is. I pretend a lot. Oh soup, right. This soup uses canned cannellini beans and store bought chicken stock. If you’ve got an onion, garlic and some spices, you are almost there. The original non-recipe calls for uncooked chicken breasts. Well, I decided my soup was going to have a rich flavor and used skinless, boneless chicken thighs. Oh.Yum. I did make the Chipotle part. I make this recipe a lot and have left over adobos and sauce that I freeze. Now I have another way of using them. My freezer thanks me. In a 4-quart pot, heat olive oil and add onions. I like to sprinkle onions with a teaspoon of kosher salt. It helps draw out the water and caramelize them. Stir onions and cook until softened and starting to caramelize. Add the cut chicken thighs and start to brown them. Stir them occasionally. Don’t worry about any brown bits on the bottom of the pan. These add flavor to the soup. Add the oregano and cumin, stirring until mixed. Stir in the minced garlic. Cook for about 1 minute. Add 4 cups of chicken stock. If you want your soup a little less soupy, add only 3 cups. You can always add the remaining cup. Add the beans and bring to a boil. Lower heat and simmer soup for about 30-40 minutes. Stir occasionally. You want to make sure the chicken is cooked. At this point, I like to turn this healthy soup into something less healthy by adding a piece of Parmesan rind. Yes, you read that right. As the cheese melts off the rind, the soup becomes a little creamier. After thirty minutes, I remove the rind and mash some of the beans with a fork, on the side of the pan. This makes it a little creamier too. This step is totally optional. Like many soups, this tastes even better the second day, if there’s any left. The Chipotle part is very easy. I spoon some sour cream or plain Greek yogurt into a jar and then add some chipotle sauce. Stir until mixed. I like it spicy, so I add a lot. Drizzle this cream over the bowled soup. The soup is fantastic without this so don’t fret if you don’t have adobos. I hope you try many different soups this winter! Spice it up a bit. Please note that I used Progresso beans. The can was 19 ounces, while other brands were less.